This is my submission to Small Small Baker's Aspiring Bakers #1: Chiffon Cakes. This is one good opportunity for me to practice my chiffons too! Lately, I've been baking quite a lot of chiffon cakes, not because of this event, but because I like chiffons. They were mainly banana chiffon and orange chiffons. For this event, I made some changes to this recipe that I've been using. I found that by adding Grand Marnier to the orange chiffon, it really gives out a very nice orange aroma that lingers for a longer time! Do try it and you'll feel the difference with the added orange liquer! 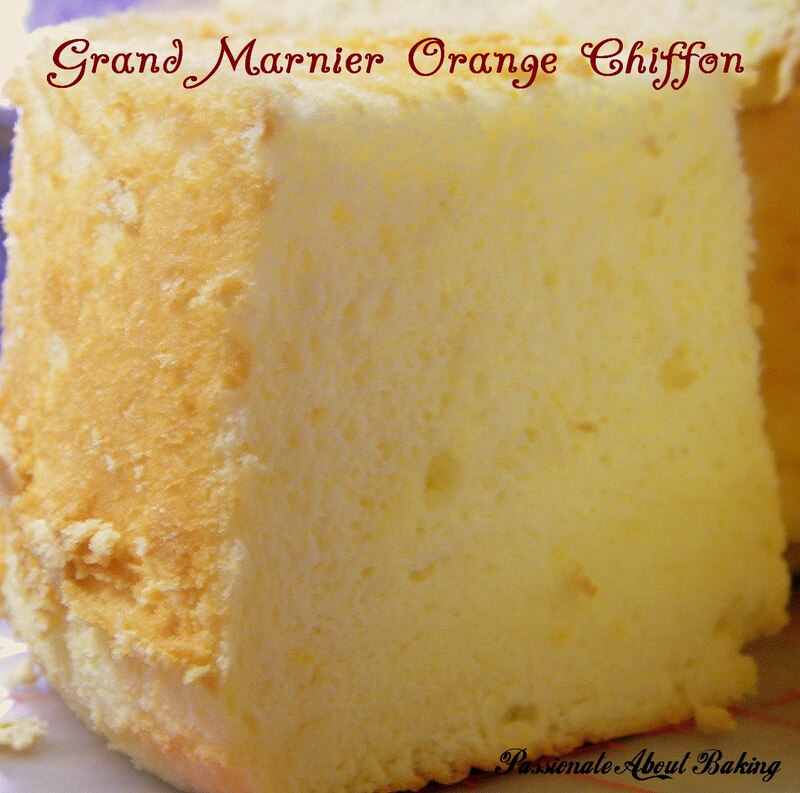 Recipe for Grand Marnier Orange Chiffon Cake, modified from Kevin Chai's "Chiffon is Done". (1) Whisk ingredients (A) till light. (2) Add (B) into (1) and mix well. (3) Then add (C), mix well, followed by (D). Ensure that they are thoroughly mixed. (4) Whisk egg whites from ingredient (E) with cream of tartar till foamy then gradually add in sugar and whisk till soft peak. (5) Scoop a third of egg whites and into mixture (3) and fold them together. (6) Pour the mix in (5) into the remaining egg whites and fold them thoroughly and quickly. (7) Pour into a 9" tube pan. (8) Bake at 170C for 45mins or till cake is cooked through. 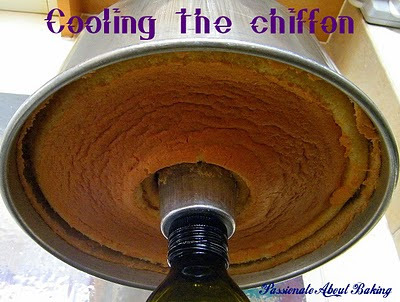 (9) Remove from oven and invert the cake (still in the pan) onto a bottle and leave it to cool down completely. (10) Remove cake from tube pan and slice. Jane, your chiffon looks so fluffy, soft and high!! Very nicely done!! Jane, thanks for joining! Your chiffon is so tall and looks cottony soft. Great idea to add grand marnier! Very soft and fluffy chiffon. Lovely! It must be very nice! The chiffon looks soft & fluffy. Grand Marnier is more expensive than Cointreau, also an orange liquor. :p I didn't know actually, otherwise, I would have bought Cointreau rather than Grand Marnier. Heehee... One bottle of Grand Marnier cost close to S$50 from DFS. wow - the texture of your chiffon is amazing! And the light yellow colour is so pretty. Save a piece for me! Love the idea of adding Grand Manier into the cake! is it orange flavor even more intense? Looks really soft!! Ur chiffon is looking so pretty! tall, fluffy and so soft! great job! I have this book too! 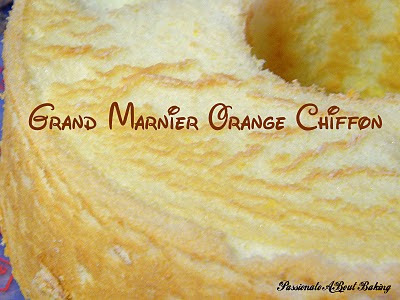 bet the chiffon cake taste good with the grand marnier. I have thought of getting grand marnier but it would be difficult to use it all up. Damn, certainly interesting info. How can I get this RSS? Thanks Bakertan. I've had it for almost three years now, and I've used not more than a quarter. Heehee... You can buy Cointreau, it's cheaper. 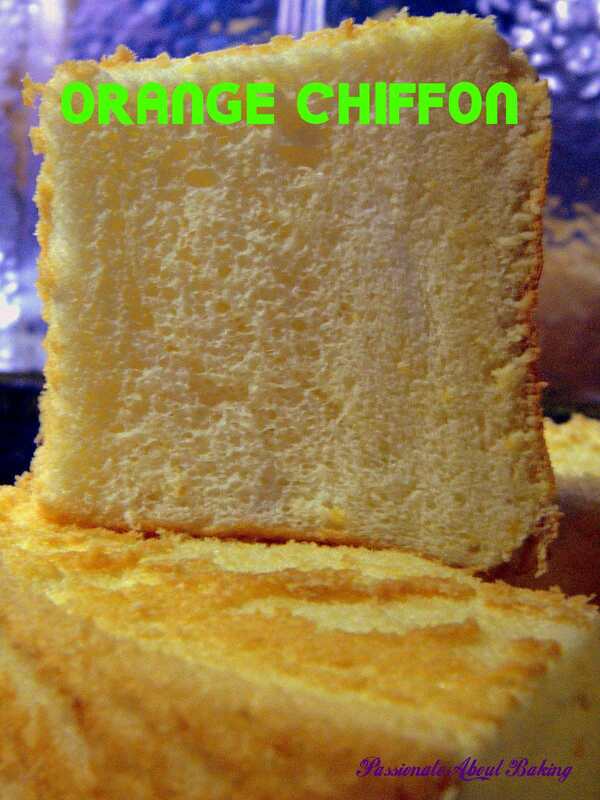 I tried the chiffon, the orange taste doesn't taste more intense though. However, I found the fragrant is stronger.